Lucky me - every season is play time in the Adirondack Park. I sometimes forget how much there is to do right outside my door here at the homestead. For example, the awesome rock and ice climbing routes on the back side of Pitchoff Mountain are just a short walk from my home. I am not a rock or ice climber, so I forget about the incredible climbing available in the Adirondacks. My climbing guide friends tell me the Adirondacks are a rather well-kept secret climbing spot in the East. Back in the day when we lived in Ulster County, New York, I recall the crowds of climbers who flocked to the "Gunks" near New Paltz. I understand Adirondack climbing routes are not nearly as crowded, but are just as challenging and fun. The truth of the matter is I am a chicken-heart about climbing. I simply cannot imagine clinging to the side of a mountain with the chance I could fall and splatter on the rocks or ice below, and enjoying myself. But....whatever floats your boat, to each his own, etc. If you are a rock climber and haven't tried the Adirondacks, you might want to give it a clamber! 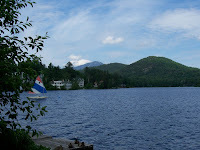 Lately, I've been floating around at the Lake Placid office of the Prudential Terry Horrocks Real Estate office in Lake Placid, where I am an agent. Today's photo features the view from the office on Mirror Lake.